The old postcard (below) depicts the Guilford Battle Ground Company’s treatment of the battlefield landscape. In 1887 the company began constructing the row of monuments and arched entrance gates. Installing a total of thirty-two monuments on 125 acres of battlefield land, the Company was more intent or ornamenting the field than recreating the authentic 1781 scene. 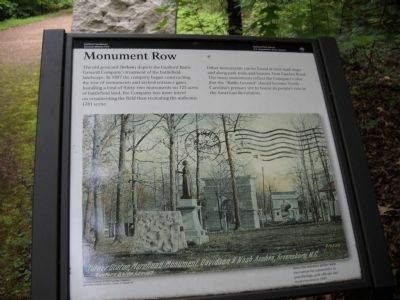 Other monuments can be found at tour road stops and along park trails and historic Garden Road. 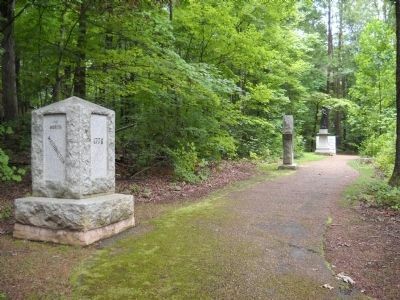 The many monuments reflect the Company’s idea that the “Battle Ground” should become North Carolina’s primary site to honor its people’s role in the American Revolution. Location. 36° 7.91′ N, 79° 50.807′ W. Marker is in Greensboro, North Carolina, in Guilford County. Marker is on New Garden Road, on the right when traveling east. Touch for map. 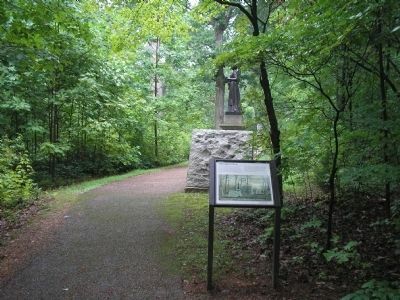 Marker is located in Guilford Courthouse National Military Park, behind the Visitor Center. Marker is in this post office area: Greensboro NC 27410, United States of America. Touch for directions. 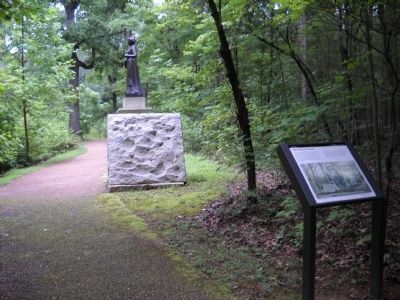 few steps from this marker); Nathaniel Macon (a few steps from this marker); A Heroine of ‘76 (within shouting distance of this marker); Gillies (within shouting distance of this marker); The Battle Begins (within shouting distance of this marker); Guilford Courthouse National Military Park (within shouting distance of this marker); Captain James Morehead (within shouting distance of this marker); Washington’s Southern States Tour (about 300 feet away, measured in a direct line). Touch for a list and map of all markers in Greensboro. 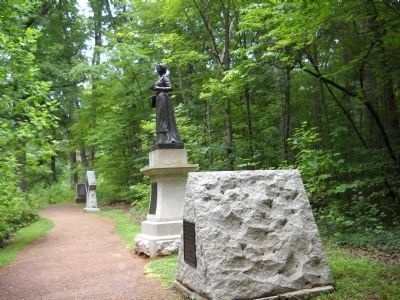 Some of the monuments erected by the Guilford Battle Ground Company can be seen in this photo taken from in front of the marker. More. Search the internet for Monument Row. Credits. This page was last revised on June 16, 2016. This page originally submitted on August 28, 2010, by Bill Coughlin of North Arlington, New Jersey. This page has been viewed 718 times since then and 5 times this year. Photos: 1, 2, 3, 4, 5. submitted on August 28, 2010, by Bill Coughlin of North Arlington, New Jersey.